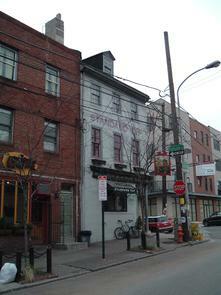 Philadelphia boasts a rich history of saloons and taverns dating back to the earliest European settlements of the 17th century, when a few enterprising would-be publicans literally dug cave-like “taverns” into the banks of the Delaware River. Eventually, tiny colonial Philadelphia was densely packed with more taverns per capita than Paris or Rotterdam, and the city’s vibrant tavern and coffeehouse culture played an integral role in developing and disseminating revolutionary-era politics. 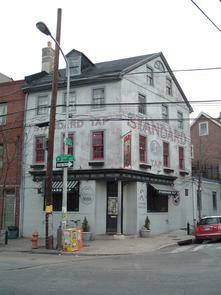 The Standard Tap is a contemporary Philadelphia pub that sits on a block of 2nd Street that once housed several 19th-century inns and taverns. The Rising Sun at 909-915 North 2nd Street and the Bull’s Head at 917-929 (roughly the sites of North Bowl and the Cescaphe Ballroom, respectively) catered to travelers, merchants, and working men from the 1870s into the early 20th century. 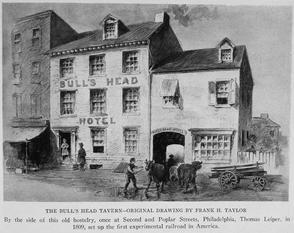 Taverns of the 18th and19th centuries were more than just tap rooms; they were hotels that provided meals and lodging for both men and horses, as well as a place to raise a pint. Beginning in the late 18th century, 2nd Street had been a marketplace, a highway, and later, a mass transit route, and so was a prime location for taverns and inns. By the 19th century, hotels in the Northern Liberties also furnished inexpensive temporary lodgings for people seeking employment in the area’s abundant mills and factories. 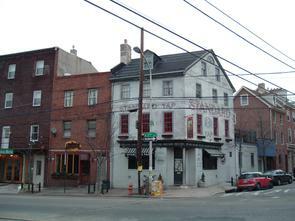 The Standard Tap opened at 901 North 2nd Street in 1999, and was one of the first in a new wave of 21st-century neighborhood taverns in Northern Liberties to serve hearty pub food and offer an array of locally-brewed beers on tap. Graham, Robert Earle. "Taverns of Colonial Philadelphia," Transactions of the American Philosophical Society, New Series, vol. 43 no 1 (1953): 318-325. Historical Society of Pennsylvania. "Northern Liberties." Self-guided walking tour printed guide, Philadelphia, PA: Historical Society of Pennsylvania Summer History Institute, 1984. Thompson, Peter. Rum Punch and Revolution: Taverngoing and Public Life in Eighteenth-Century Philadelphia. Philadelphia: University of Pennsylvania Press, 1998.